Wouldn't it be wonderful, if children in your primary school spent their lunchtimes engaged in a range of fun and interactive playground games, that kept them active, occupied and happy? You're going to have everything you need to make this happen. Click the 'buy now' button below to get immediate access. find many pupils simply don't know any (non-contact) games to play in the playground (and get into trouble as a result)? feel lunchtime supervisors would be more effective if they led playground games (rather than just monitoring play) - meaning that behaviour incidents were nipped in the bud, or avoided altogether? have to waste precious teaching time every day dealing with unresolved incidents from lunchtime? If you answered yes to any of the above, Problem-free Playtimes is written specifically with you in mind. Children who have little to occupy their 'free time' quickly get bored. They end up in disputes with their peers, or resort to overly physical play, which inevitably ends in tears. What's worse, the ripple effect of poor lunchtime behaviour eats into afternoon learning time. Teachers often tell me they are forced to waste 5 to 10 minutes every single day dealing with this low level disruption. I want you to reclaim that time. That's why I've created a really simple solution... based on proven practice in real primary schools. Imagine what it would be like if playtimes really were problem free. children's spend time productively, happily socialising with friends. squabbles and falling outs are few and far between. supervisors lead and manage playground games confidently. children come into lessons calm and ready to learn. Imagine the relief of clawing back those precious minutes each day. Of being able to get on with your teaching in a relaxed post-lunchtime classroom, without dealing with frazzled staff and pupils. Of less time spent dealing with parental complaints. There is a quick and easy way that you can make this dream a reality in your school: download Problem-free Playtimes today! 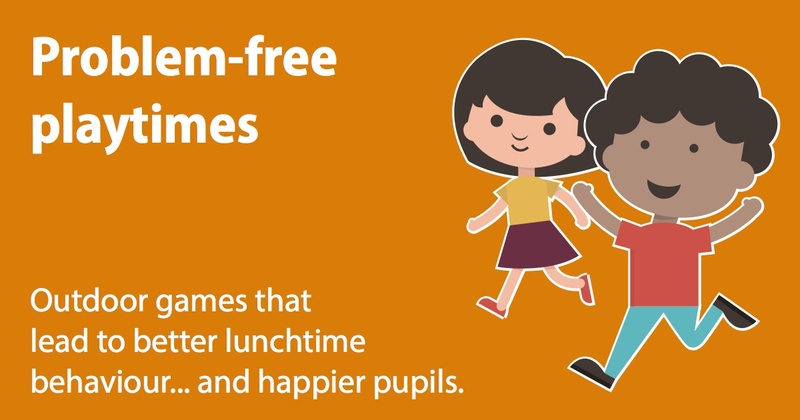 We've put together a pack of playtimes games that have been proven to have a positive impact on primary school lunchtimes. is quick to explain, so children of all ages can participate. requires minimal equipment, so it's easy for your supervisors to get out and run, and won't involve additional spending. can be played in five minutes or less, so your students will be entertained quickly. encourages positive social interaction, meaning your pupils will be learning important collaborative skills. We've also included a comprehensive list of playground resources that have proven to be effective at fostering play in real primary schools. And there's even a list of sporting activities (other than football) that you can use to diversify children's interests. Plus, you access the Playground Games Compendium through an immediate download, so your staff can begin transforming lunchtimes straight away. But wait! Your pupils' knowledge of games ideas is only half of the problem. Most lunchtime supervisors receive little or no training before they start working in schools. They are expected to manage the most unstructured and challenging part of the day, with the highest number of pupils. It's no wonder there is so much friction during this part of the day! So, to help you to support and empower your lunchtime supervisors, I've created a training video. It's a step-by-step guide explaining how to get children involved in playing more constructively on the playground. Don't waste time writing your own training, explaining to your supervisors how to get children involved in positive play - it's all there for you. All you have to do is press play! And because you'll have lifetime access, you can repeat the training as often as you like, with new or existing staff. The entire playground Games Compendium, which consists of 27 fun, easy to follow, attractive, printable game cards. There's very little equipment needed and the games are fantastic for all primary aged pupils. Lifetime access to the video guide 'Engaging children in play'. A high quality, easily accessible training resource to help skill up your lunchtime staff in positively interacting, occupying and engaging your pupils. Want to benefit from our experience? We've conducted more than 50 lunchtime observations in primary schools and witnessed the powerful impact of involving pupils in play and boosting lunchtime supervisor skills. It's a winning combination! These resources are delivered to you digitally - so there's no waiting for the post; you can start benefitting within minutes. Who is Problem-free Playtimes for? any primary school who wants to reduce lunchtime incidents and create happier playtimes. schools who would like to foster a more confident and proactive lunchtime staff team. schools where teaching time can be eroded by behaviour incidents that spill over from lunch. We are so confident that you will find 'Problem-free Playtimes' useful that we offer a money back guarantee. If you are not happy that the contents of the programme are of value, then get in touch with us by email within 14 days of purchase, and we'll refund your money. Start working towards your dream lunchtimes, right now! Lunchtimes should be a time everyone in school looks forward to and enjoys. You can make that dream a reality by using Problem-free Playtimes. ...or take action and download Problem-free Playtimes, and start changing lunchtimes for the better, right now. To help you with your decision, and because children in every school should enjoy brilliant lunchtimes, Problem-free Playtimes is priced at only £8.99..
Let's put that in perspective - enough change from a tenner to buy a chocolate bar! And a reduction in everyone's post lunch stress levels! Think how popular that would make you in the staffroom! Press the 'Buy Now' button below to secure your immediate access to Problem-free Playtimes - and start enjoying more harmonious lunchtimes and calmer afternoon lessons. I'll see you in the videos. When you click 'Buy Now', your transaction will be handled securely by stripe.com and sendowl.com, companies that specialise in payment processing. We will not share your personal details with anyone else.